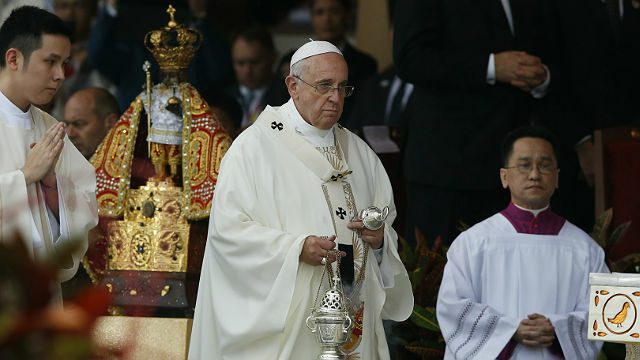 Pope Francis celebrated Sunday Mass in Rizal Park in Manila for approximately 6 million people on January 18, 2015. 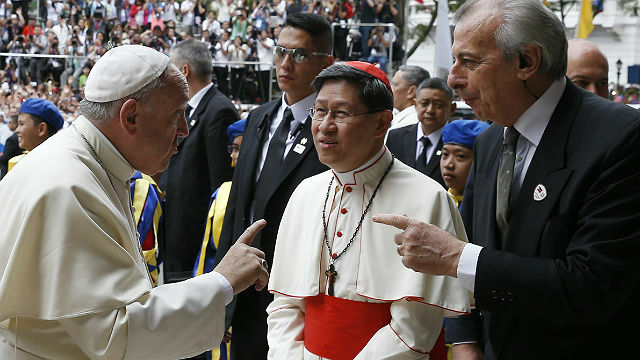 Below you will find the full text of his homily & the greetings of Cardinal Tagle & Archbishop Villegas. “A child is born to us, a son is given us” (Is 9:5). It is a special joy for me to celebrate Santo Niño Sunday with you. The image of the Holy Child Jesus accompanied the spread of the Gospel in this country from the beginning. Dressed in the robes of a king, crowned and holding the sceptre, the globe and the cross, he continues to remind us of the link between God’s Kingdom and the mystery of spiritual childhood. He tells us this in today’s Gospel:“Whoever does not accept the Kingdom of God like a child will not enter it” (Mk 10:15). The Santo Niño continues to proclaim to us that the light of God’s grace has shone upon a world dwelling in darkness, bringing the Good News of our freedom from slavery, and guiding us in the paths of peace, right and justice. The Santo Niño also reminds us of our call to spread the reign of Christ throughout the world. The Apostle tells us that because God chose us, we have been richly blessed! God “has blessed us in Christ with every spiritual blessing in the heavens” (Eph 1:3). These words have a special resonance in the Philippines, for it is the foremost Catholic country in Asia; this is itself a special gift of God, a blessing. But it is also a vocation. Filipinos are called to be outstanding missionaries of the faith in Asia. Sometimes, when we see the troubles, difficulties and wrongs all around us, we are tempted to give up. It seems that the promises of the Gospel do not apply; they are unreal. But the Bible tells us that the great threat to God’s plan for us is, and always has been, the lie. The devil is the father of lies. Often he hides his snares behind the appearance of sophistication, the allure of being “modern”, “like everyone else”. He distracts us with the promise of ephemeral pleasures, superficial pastimes. And so we squander our God-given gifts by tinkering with gadgets; we squander our money on gambling and drink; we turn in on ourselves. We forget to remain focused on the things that really matter. We forget to remain, at heart, children of God. For children, as the Lord tells us, have their own wisdom, which is not the wisdom of the world. That is why the message of the Santo Niño is so important. He speaks powerfully to all of us. He reminds us of our deepest identity, of what we are called to be as God’s family. Please pray for me! God bless you all! You often end your encounters with people by saying, “I ask you to pray for me.” We promise to pray for you. But we want to assure you that Jesus prays for you. Jesus himself declared to Peter, “I have prayed for you that you own faith may not fail.” (Luke 22:32). Your Holiness, you are blessed. Jesus prays for you. We your beloved Filipinos unite ourselves with Jesus in praying for you to God the Father. You arrived in the Philippines three days ago. Tomorrow you will go. Every Filipino wants to go with you – not to Rome - but to the peripheries, to the shanties, to prison cells, to hospitals, to the world of politics, finance, arts, sciences, culture, education, and social communications. We will go to these worlds to bring the light of Jesus, Jesus who is the center of your pastoral visit and the cornerstone of the Church. We will go where the Light of Jesus is needed. Here in Luneta, the Qurino Grandstand, where heroes are revered, newly elected presidents take office and popes meet the Filipino faithful, here in a place of new beginnings, send us forth as missionaries of the light. Before you go, Holy Father, send us to spread the light of Jesus. Wherever the light of Jesus shines, you and the Filipino people will always be united. Mabuhay, Santo Padre! Mabuhay si Kristo! Let the light of Christ shine! The sun is now setting on Manila Bay. The romantic poets among us call the Manila Bay sunset view as the most beautiful sunset in the world. The setting sun ends the day. The sunset ushers in the twilight. Some of us are afraid of the sunset as we are afraid of the dark. But we are not afraid anymore. In the many days and months and years ahead, we will always bask in the sunrise because you have brought us awesome sunshine to last us many lifetimes. Holy Father you are our sunshine! For many days since you came last Thursday, it has been always been sunrise of smiles for us Filipinos. You have brought us joy. You have brought us hope. You brought us warmth. You have brought us Jesus. When you give us the blessings tonight, we promise you “We will be your lights; we will be the lights of Jesus for Asia and the world”. We will light the world with the mercy and compassion of Jesus. We will light the world with the joy of the Gospel. On behalf of the bishops of the Philippines please receive Most Holy Father our message of gratitude for celebrating the fiesta of the Santo Nino with us today. We are a nation of children, beautiful children, holy children, God loving children. The children of the Philippines are our sunshine too. Children are our happiness. Children are our hope. Children are our wealth! We are all children of our loving Father in heaven. Thank you for being a child of God with us, among us. You are our Father. You are our brother. You are our friend. You are our inspiration. You are our sunshine! Pope Francis we love you!